It's something I have to post about every year, and like Michael Myers, it always comes back. Yes, the famous Halloween Tree, made memorable by Ray Bradbury, is a recurring feature at Halloween Time. This festive and lit up deciduous icon glows with a lovely red and orange in Frontierland, full of whimiscal Halloween themed ornaments. The Halloween Tree is innocent fun and joy, and I always enjoy stopping to admire it when I'm passing by. 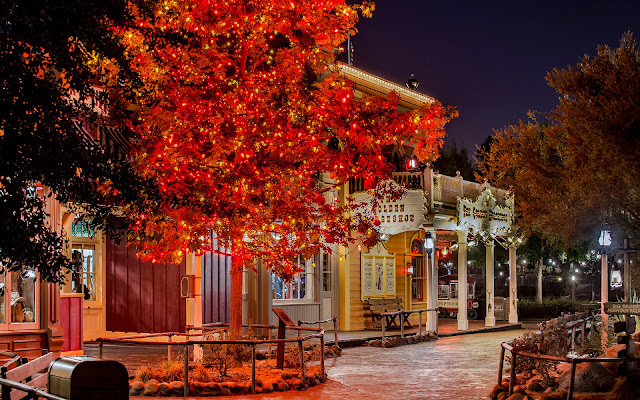 The lovely Halloween Tree in Frontierland at the end of the night.